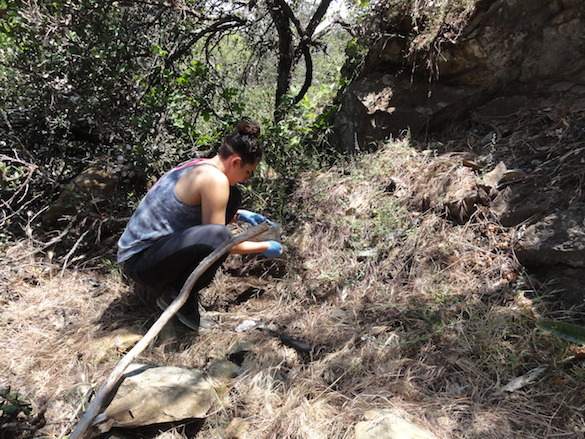 San Diego, CA – Amineh AlBashaireh (’18) and I are working with USD scientists, Dr. Bethany O’Shea, Elizabeth Johnston, and Eric Cathcart on the geology of Black Mountain in San Diego, CA. 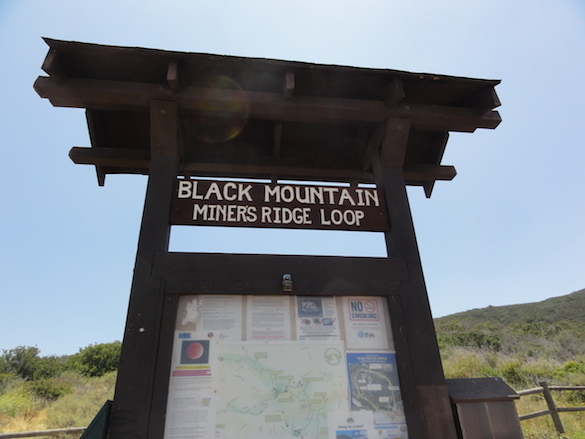 Black Mountain Open Space Park is a popular hiking and mountain biking destination. The Santiago Peak Volcanics are exposed in the park. 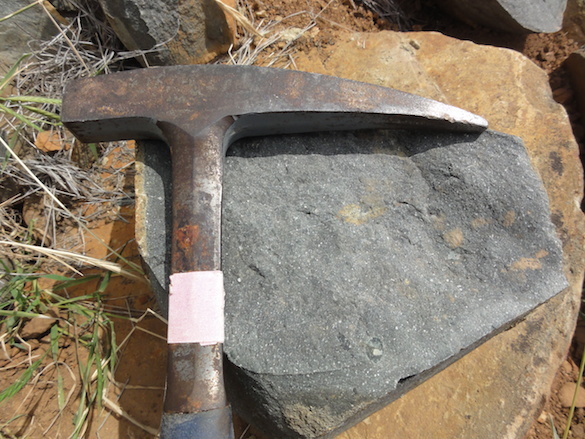 These rocks are early Cretaceous in age (~110 Ma) and are thought to represent the volcanic arc associated with the Peninsular Range batholith (Herzig and Kimbrough, 2014). 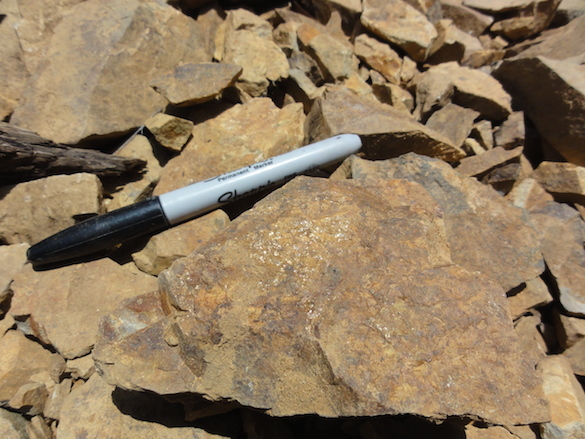 Slightly metamorphosed andesites and basaltic andesites are present as gray to dark gray aphanitic (fine grained) rocks with scattered phenocrysts (crystals) of white plagioclase. 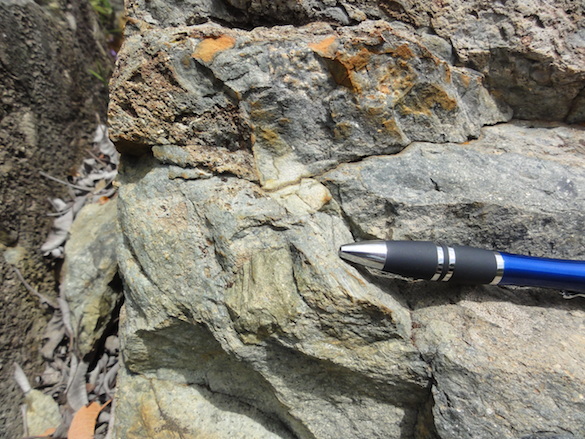 There are also volcaniclastic rocks like this tuff breccia that include large clasts of andesites, basaltic andesites, and fragmental volcanic rocks. 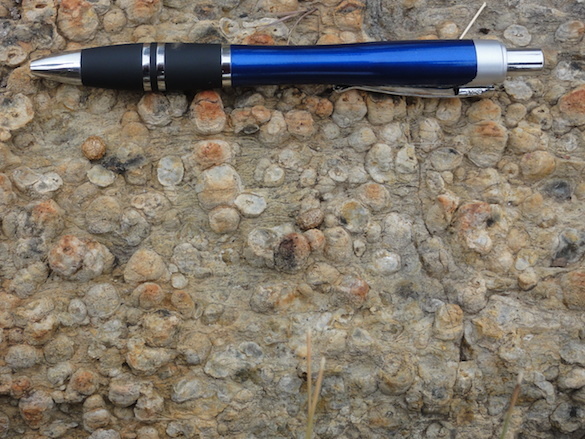 Outcrops of lapillistone contain accretionary lapilli, or rounded spheres of volcanic ash, that show evidence of the more turbulent and explosive nature of this volcano. 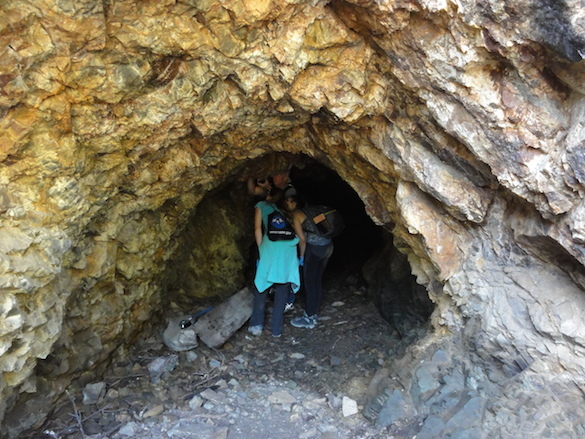 Hikers and bikers who visit Black Mountain may be less familiar with its volcanic history and more familiar with its mining history. In the 1920s, this area was briefly mined for arsenic. The arsenic was used in pesticides at the time (Stewart, 1963). 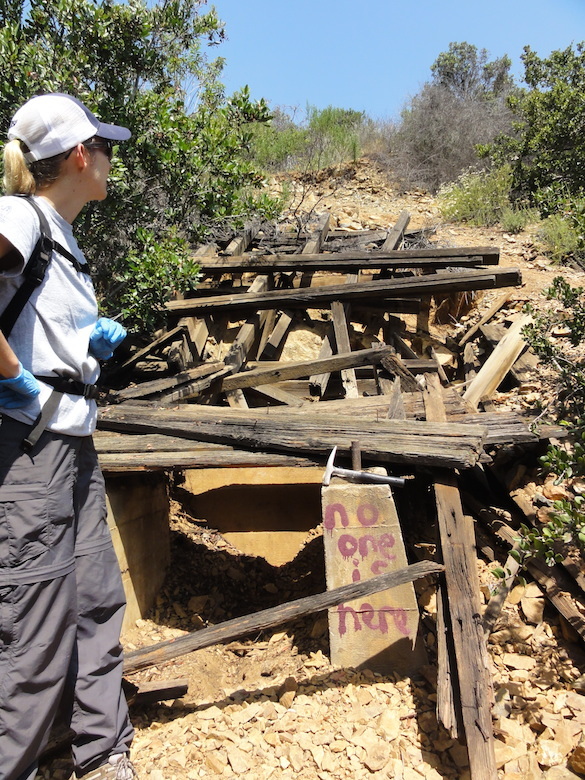 Our research group is exploring one of the abandoned mines. In the mine waste, you can see shiny gold specs of aresenopyrite (FeAsS). Arsenopyrite is a sulfide mineral in which some of the sulfur is replaced with arsenic. Amineh is studying trace element concentrations in the soils on Black Mountain. Here she is collecting samples. In the next few days, and over the course of the summer, we’ll show you how she processes these samples in the lab. 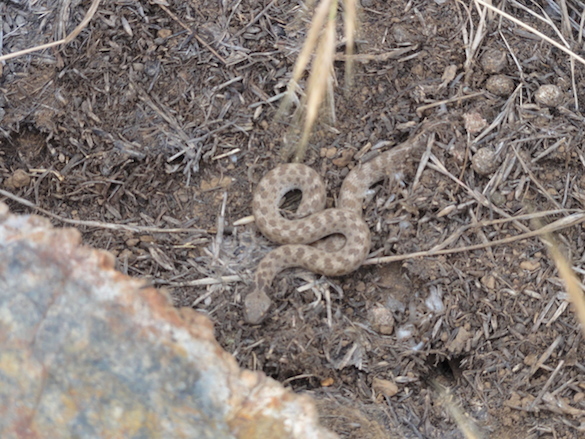 This was a small (~30 cm) rattlesnake that we saw earlier in the day, and we take field safety seriously, so when we heard a rattle coming from the tall grass, we ended our sampling and called it a day. It was an exciting, productive, and safe day in the field. More to come in the next few days as we start on our lab work. Herzig, C.T. and Kimbrough, D.L. 2014. Santiago Peak volcanics: Cretaceous arc volcanism of the western Peninsular Ranges batholith, southern California. GSA Memoirs 211: 345-363. Stewart, R.M. 1963. Black Mountain Group in Weber, H.F., Geology and mineral resources of San Diego County, California: San Francisco, California Division of Mines and Geology, 49-50. If you have the time, you should go to Palomar Observatory, not far to the NE of San Diego. It is the home of one of the largest (if not the largest) single-piece mirrors on any astronomical telescope, the 200 inch Hale. Larger mirrors have been made, more recently, from smaller individual segments (like the twin Kecks on Mauna Kea, both almost twice as big, but made of hexagonal segments), but the Hale was cast from a single piece of Pyrex glass, and is responsible for a lot of cosmological (and, therefore, Earth) history-making in the last half of the 20th century. It doesn’t have the beautiful architecture of the Griffith Observatory, north of LA, but it is a significant part of science history, and well worth the trip. Must have taken courage to be an arsenic miner! Cool posts. Nice snake. If I remember correctly, from the old days of (non-OSHA) mineralogy, we would puff the reducing part of a Bunsen burner flame onto a lump of arsenopyrite in a depression on a charcoal block, giving the distinctive odor of sublimated As: garlic. I imagine the mines smelled of garlic all the time, particularly after blasting. Thanks for the suggestions, Bill. I love the smell of broken rocks, but I hadn’t thought that it might have smelled of garlic at the time. I’ll post a followup that shows how we’re analyzing the samples – mostly by XRF or ICP these days.